This map shows the world broken down into 22 regions, each with about the same population as the United States (give or take about 10%). 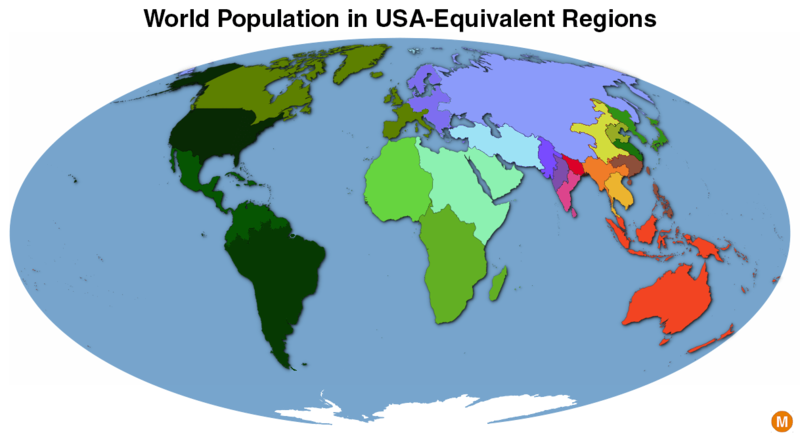 There are many ways of looking at the world’s population distribution. Other population maps posted here focus on the extremes of population density, the contrast between the most densely packed areas of the world and the large expanses where few people live. 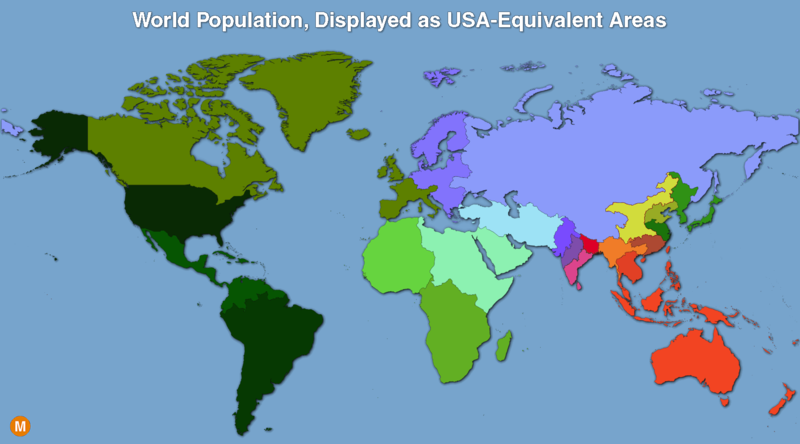 In this case, I thought it would be interesting to see the world’s population broken up into USA-sized chunks, to give a familiar frame of reference for interpreting it. The population data for the map comes from the NASA Socioeconomic Data and Applications Center‘s gridded world population dataset, which breaks the world’s population down into tiny cells measuring about 3 miles x 3 miles. The borders shown here are my best attempt at splitting the population up evenly. The largest of the 22 pieces has an area of nearly 7 million square miles, about twice the size of the U.S. At the other extreme, the smallest region measures only 125,000 square miles, about the size of New Mexico. The map above uses an equal area map projection (Mollweide), which is to say the size of each region in the map is proportional to its size in real life. For those of you who, like myself, prefer traditional cylindrical map projections, even if they are somewhat less accurate, here is the same map with the more common Miller Projection. Next Article Illegal Conversions – What’s the Real Story?